I am incredibly fortunate to call myself a six-time cruiser. In the back of my mind I embarked on this trip with the idea tucked in the back of my mind that this very well might be my last one. After all, I’ve done this 6 times now, I’m getting older, and perhaps I’ve gotten my fill of this particular activity and it’s time to pass the baton to other fans to give them their chance. Sumo wrestler Backstreet Boys – During the game show the guys were supposed to sumo wrestle each other, but kicked things off by attempting choreography in their sumo wrestler suits. I can’t be the only one who would gladly sit through an entire concert of them in these getups. Lip Sync Battle at Brian’s game show – Brian brought up 2 groups of 5 fans to represent each Backstreet Boy. And then they battled it out lip-sync style to various BSB songs. I think my favorite part was when Brian jumped into the audience pretending to be a fan. This event just had a lot of laughs, which is exactly what I would expect anytime Brian is around. New music! AJ shared about 5 songs off his new solo album while Kevin shared around 10 song contenders for the new Backstreet album. I got a little emotional just thinking how special of a moment that is that they shared new music with us that no one else has heard. And the idea that our response to those songs may actually shape the new album. I am more excited and ready than ever for new music from our boys! Storytellers Concert – Okay, so this concert made my Backstreet loving head explode. So many fun rare songs we don’t get to hear often like Climbing the Walls and If I Knew Then. It was a perfect mix of great music, funny anecdotes, and even a touch of emotion from our boys. One of the best cruise concerts they’ve done. 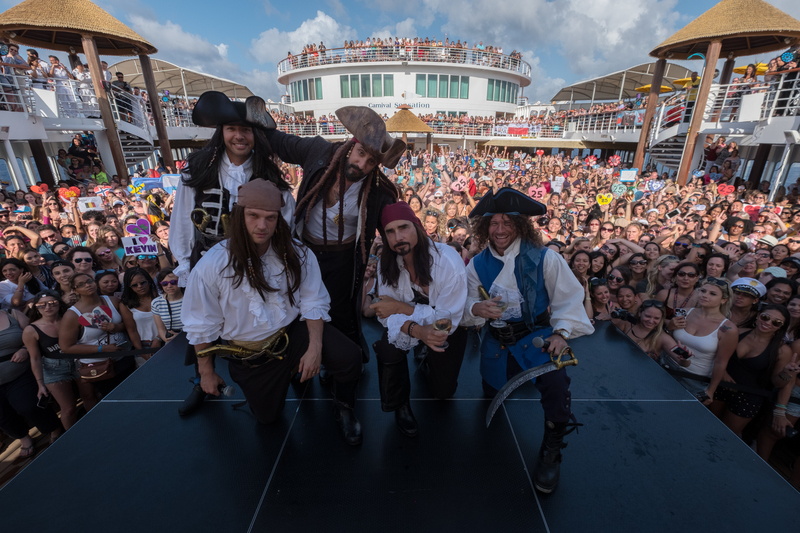 Pirate Backstreet Boys – As much as I love the sailor and captain outfits that have graced our boys in the past, I was totally digging our pirates this year. I love that they keep it fresh for us. Plus – Kevin’s hair was glorious in pirate form. Millennium Night – Holy crap. This. This is why you go on a Backstreet Boy cruise. In case you missed it, the boys performed along to the ENTIRE millennium soundtrack. And then proceeded to roll into Black & Blue, and various other random songs from their entire discography including solo material, rare unreleased material we haven’t head in over 2 decades, Nick & Knight, and so much more. I couldn’t believe my ears for over 2 hours. And to top it all off, Nick and AJ jumped in the pool with fans. Kevin was playing bartender serving shots to fans for hours. While Brian and Howie were taking pics with fans. I legit needed to invent a way to clone myself 5 times over in order to experience all that was Millennium night. Selfies, selfies everywhere – The boys absolutely stepped up and between the 5 of them and spent hours upon hours taking pictures with the fans and making everyone on board feel special. From the bottom of our hearts- we thank you! Overall this cruise was absolutely perfect for the 25th anniversary. The boys seemed very reflective and appreciative of the 25 year journey that we’ve all been on together. If and when the boys do another cruise, count me in. As for everyone else, I suggest start saving up now. If the next cruise was even a fraction as good as this one, you definitely don’t want to miss out!